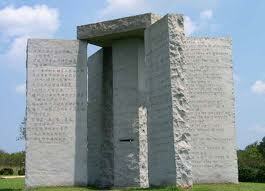 "THE GEORGIA GUIDESTONES" is a large granite monument in Elbert County, Georgia, USA. 1.Maintain humanity under 500,000,000 in perpetual balance with nature. . So , just how are they going to get the global population of approximately seven billion people down to half a billion ? May I suggest one of them is to tell people it is ok to kill unborn children , this is having a huge impact upon the future of nations . We are being told there will not be enough young people around in the near future to help pay for ageing populations . Well , if the unborn were not being murdered in the womb then there would be enough workers paying taxes to pay for pensions . And now read the rest .........I like the last one which tells us not to be a cancer upon the earth ......EUTHANASIA strikes a chord here . This will certainly keep the populations down . The ten commandments of the New World Order . 1.Maintain humanity under 500,000,000 in perpetual balance with nature. Can YOU PASS the TEST ? Does oil and coal production take a long time ? Does fossilization take a long time ? Creative ability of raw energy ?????????? ?